Her years at Berkeley Hall have seen her teach math at every grade level from 1st through 8th. For the past four years, Kelly has served in our Junior High School, coaching and mentoring our 7th and 8th graders and making sure that they are fully prepared for the math and science courses to come in whichever selective Los Angeles-area high school they choose to enroll. As math test scores and Berkeley Hall alumni testimonials make clear, Kelly excels at this. It is her ability to see the limitless nature of her students and instill in them an understanding and love for math that makes all the difference. Kelly started our Peer Tutoring Program at Berkeley Hall in which junior high students pair up with younger students and tutor them in math and study skills. "This program is not only a wonderful oportunity for older students to take on a leadership role, but it helps the junior high students solidify their understanding while they tutor and mentor younger students." said Kelly. Sometimes we don't need to look beyond our own front door to find a wealth of resources. This is what's been discovered at Berkeley Hall School with the launch of this year's Peer Tutoring Program, a program where qualified 6th-8th grade students tutor younger students in math, English and even study habits. On any given day after school, you might find up to eight pairs of tutors and tutees working together in the library, as well as others before school on Wednesday mornings. The program has gotten off to a great start, its success attributed to the willingness of the tutors who are volunteering their time in their already busy schedules, the commitment of tutees to improve their learning, and the dedication of the teachers, who provide guidance for each and every tutoring session. Progress has already been reported from various grade levels. And to no surprise at all, kids simply like working with and learning from other kids! A common question posed to Junior High math students is, "How do you plan to approach this problem?" Will you write an algebraic equation? Draw a Venn Diagram? Make a table of values and look for a pattern? Work backwards to the solution, from the data provided? These are just some of the approaches that students have the opportunity to work with, in solving the Problem of the Week. 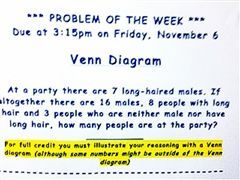 A new problem is presented each week, and students have until Friday to solve and diagram or explain their solution. The Problem of the Week is an extra credit assignment, but what better way to earn extra credit than while improving math skills? Congratulations to Baron, Cade, Dahlia, Dashiell, Miles R., Yasi, Jackson G. and Melina, for solving every problem of the week so far this trimester! See if you can solve this week's problem, pictured here.